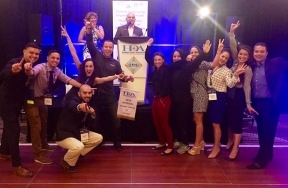 The University of Illinois at Chicago (UIC) College of Dentistry’s Hispanic Student Dental Association (HSDA) Chapter was named the Hispanic Dental Association’s (HDA) 2016 National Student Chapter of the Year at the HDA’s recent Annual Meeting in Washington, DC. This award recognizes the chapter for outstanding efforts to provide service, education, advocacy and leadership in Hispanic oral health. Selected by a committee consisting of HDA National Office staff members and invited jurors, the chapter stood out among affiliate dental student chapters across the nation. “We won due to our excellence in community outreach and activity this past year,” Jacqueline Magallanes, president of the UIC HSDA, explained. “Chapter of the Year guidelines look at community outreach, membership growth, and overall activity. We participated in dozens of community outreach events where we provided oral hygiene instruction, patient education, and free dental services in underserved communities with minority populations.” The award benefits the College and its HSDA chapter “because it highlights the diversity that represents UIC, and sheds light on the needs of our minority communities,” Magallanes added. She offered special thanks to alumni Dr. Marcela Escobar, Dr. Carla Delafuente, and Dr. Genaro Romo of the Greater Chicago HDA for their support of the UIC HSDA.